"Crafted with heart, created by two." Roaming Roots describes our process of creation. Our creative process begins simply by following an idea. Exploring our neural networks, we roam down these paths of discovery, finding our roots along the way. We all have the creative impulse. We are gathering that universal principle in by following our roots in crafting and imagining our designs. Your creative impulse led you to desire to enhance your living space to support your inner drive to manifest the life you most desire. We are so glad you’ve found us during this process, and we have every intention of creating a piece you’ll cherish through out every creative stage of your life. Roaming Roots is a collaboration between two friends who desired creative expression that was not being satisfied. We came to the realization that our current occupations were not allowing us the ability to express ourselves or live our truth. We wanted the freedom to find our passion from creating something meaningful and tangible. We didn’t realize how far our original idea of Roaming Roots would go when we started down this path. We didn’t start out with a full-time business in mind. Fortunately, as a friend once said, if you do what you love, opportunities will always present themselves. We have been overjoyed to find this to be the truth. The more that our roots spread, the more abundant our creative energies become. Onward and upward! A home is an ever-evolving collection of your life experience. Surround yourself with items that tell your story! "I want them to connect to the angular nature of my work, and the natural texture, as I'm using a material that they can touch and feel the texture of wood grain. So I am always excited when I'm at an art fair and people can't help but touch my work." Every piece I design will not become the new 'best ever', but there is a lesson to be found in each one, nonetheless. There is no such thing as failure in art." "When a space is embodied with only pieces that light a person up, inspire them, and bring them joy, it is a special feeling. If there is no intention behind the pieces in a space, I feel there is a feeling of drudgery or 'stuckness'." 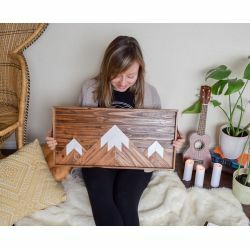 "I create from a place of presence and draw upon my life experiences to bring the thoughts of a 27 year old wanderer into reality through the medium of wood and neutral colors." "Honestly, how I create my designs happens when I can get into the flow of the moment, and so I design them in shop, using actual wood piece instead of a pencil on paper. Some of my favorite pieces have sprung into my mind during meditation or when I'm just strolling along in nature. I always attribute my creativity to a force outside my own mind." "The different reactions to my work have really surprised me. I am considered an artist by some, and a hobbiest by others. It's been so intriguing to delve into the definition of a feminine artist using the masculine medium of wood. When I'm getting some stain or paint at a hardware store and the employees explain to me how to use it when I've been using it for years, that always cracks me up."